Girls have a major interest in researching what is best for their skin and I am also not exceptional. We are always looking for the products which can gives glow on our skin or face. Over the past few months I have been taking a couple of different steps to improve my skin and one of them is eating as much fruit as I can (atleast trying to eat one daily). 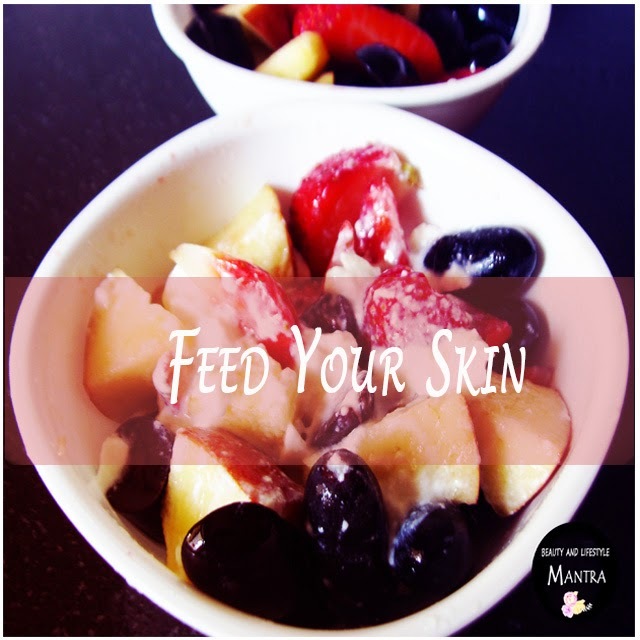 Simple lifestyle changes like including fruit in your daily diet can really gives you back that glow. I love to eat fruits only for the sake of my skin and hair. Fruits such as mango, papaya, strawberries, watermelon, oranges all have such a high antioxidants, which are great for our skin. Fruits help with natural hydration, clear complexion; skin rejuvenation and overall improves skin texture making it appear youthful and glowing. There are a variety of fresh and dried fruits available at most grocery stores, find your perfect match by trying different flavors. So here are my top eight to give you back that glow. Pomegranate: Pomegranates are superb for overall skin health. This red fruit is power-packed with antioxidants which fight against free radicals, control acne, and prevent wrinkles. Apple: Apples have excellent toning capabilities. You can achieve perfectly toned and conditioned skin if you eat apples. Apples are also rich in pectin – the starch essential in driving away acne! The natural acid found in apples helps in removing the excess amount of oil from the skin thus preventing the growth of blackheads, white heads. Bananas: Banana is an all season fruit and a good source of iron, magnesium and potassium and helps reduce menstrual cramps. The effect of banana on skin too is not something that can be ignored. Bananas are rich in vitamin A, B and E and hence work as an anti-aging agent. A fresh mashed banana facial can do wonders for your skin. Papaya: Papaya is a natural exfoliating tonic. It leaves your skin spotless with its high vitamin A content. Papaya can also be applied on skin leaving a long lasting glowing effect on the skin. Lemon: Consuming citrus fruits helps guarantee clear skin! Fresh lemons are always suggested to clean dark spots under arms and elbows. The scrubbing of lemon on the skin lightens the color of the skin and acts as a bleaching agent. Mango: Mangos are called the king of fruits for not just its taste but also for health benefits. The soft pulpy fruit has an amazing effect on skin too. Rich in vitamin-A and rich antioxidants, it fights against skin aging, regenerates skin cells and restores the elasticity of skin. Finally not the list, the seasonal fruit Strawberry. Strawberries have more anti-aging vitamin C per serving than oranges or grapefruit. The presence of malic acid in strawberry makes it a natural whitening agent. It also has loads of antioxidants which lend your skin a healthy radiance from within. Read more : How can we use Strawberries as a beauty ingredient ? So this is my favorite fruits list. Hope this will helps you! You can try out some of the fruits as a face pack or as a facial! It's superb! Let me know about your favorite skin glowing fruit. All these fruits are really interesting and healthy for those who love having healthy diet. They may also love to know about fruits like Noni that is actually a super fruit as I had been using Tahitian Noni Juice for so long and found its result really impressive.